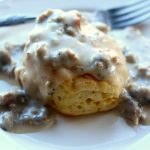 Country style gravy made with ground sausage and diced bacon is infused with flavors as it is quickly pressure cooked. When served over freshly baked biscuits (homemade or from a can) it tastes like a good old fashioned southern breakfast (although we eat this often for dinner). Prepare your biscuits and turn the oven on to bake them. Turn your Instant Pot to the saute setting, adjust it to “more.” Add the sausage and bacon to the pot. Break up the sausage with a wooden spoon. Brown the sausage for about 5 minutes. Do not drain the grease. Add in the chicken broth. Cover the Instant Pot and secure the lid. Make sure valve is set to “sealing.” Set the manual button (pressure cook button) to 5 minutes. While the timer is counting down on your Instant Pot get out a medium bowl. Whisk together the flour and milk. When the timer beeps indicating that the 5 minutes are up move the valve to “venting.” Open the pot when you are able. Turn your Instant Pot to the saute setting on “more.” Pour in the milk mixture. Add in the salt and pepper. Stir until the gravy is thick and bubbly. Turn the Instant Pot to the Keep Warm setting. Serve the gravy over the biscuits. This recipe came to pressure very quickly for me and the pressure release didn’t take hardly any time either. Win!